Hive Pocket�, our most anticipated version of our award winning flagship game is now officially available. This wonderful travel version comes with 26 beautifully crafted Hive pieces, includes a very nice drawstring bag and also the two expansions to the game: �The Mosquito� introduced in 2007 and �The Ladybug� which was added to the Hive� family in 2010. The pieces measure 25 mm across and 10 mm in depth and the whole game weighs only 200g including the bag, as compared to the full size game which weighs 600g. This version is great for taking on trips where space is an issue or for backpacking where weight could be a problem. Playing the game even on small airplane tables is now easier than ever. 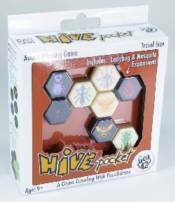 Hive Pocket� is the very same wonderful game, with the same quality you'd expect, but much smaller and compact. Now you never need to go anywhere without Hive� again.